A friend at work bought me this for my birthday way back last May. I’d said I was interested in it after reading Pamuk’s The White Castle while I was recovering from appendicitis. It was very different to that, being non-fiction, so I wasn’t too mystified by the esoteric nature of Pamuk’s novel. It’s a description of a city. It’s a description of Pamuk’s youth. Sometimes it’s both. So, you can really see the novelist part of him coming through when he tries to be a historian. In fact, he aknowledges this at places in the book and that was helpful for me so that I could understand why the focus wandered from time to time. Interestingly, if you’ve read The White Castle, you’ll pick up immediately on the opening line which seems to be the entire plot of the novel. I was, however, expecting a kind of historical narrative of the city or at least some synchonous description of it at a certain period. What I got instead was a kind of scrapbook of recollections, in no particular order and on no particular theme. All though orbited the title at greater or lesser distances. The book has tremendously evocative photographs and, for any fan of the city (which I’m not, having never been there nor read about before) the book is worth it simply for these. The writing is, I found, less evocative. Quite why this is I’m not sure entirely but it could have something to do with the fact that every now and then I found myself reduced to the role of ignorant plebian while the Nobel Laureate elaborated history, literature and philosophy which I’d simply never heard of. If I had been to Istanbul, if I had spent any length of time there, I’m sure I would have related much more to it. As it was, it took me to a part of the world I’ve never been and am unlikely to go to any time soon. It was a valuable excursion for that. Less valuable for me though were Pamuk’s romps into the Arts of which I know precious little. 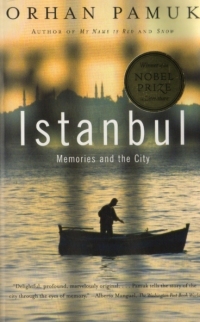 This is my favorite book by Pamuk, and I recommend it to everyone who plans a visit in Istanbul.